Hybrid and EV sales: The Toyota Prius dropped out of the top spot for the first time in January, with the Ford Fusion Hybrid finishing first in U.S. sales. The Prius hybrid drop goes beyond the usual sales decline at the time of year, dropping 28.1% in sales from January 2016, according to HybridCars’ Dashboard. The Fusion has been doing well lately, also finishing in the third spot in the plug-in hybrid category for January. The Prius Prime plug-in hybrid had a good month, finishing ahead of the Toyota Model S in sales. The plug-in vehicle market leader was the Chevy Volt, with 1,611 units sold in the U.S. last month. Another interesting result was seeing the new Chevy Bolt all-electric car come in at 1,162 units sold, right behind the Model S, which had 1,200 units sold. Overall, plug-in sales were down 52.4% from December but up 65.1% from the previous year; hybrids were down 32.3% from the previous month and up 7.6% from a year ago. Super Bowl ads: While the controversial Trump administration policy on immigration had its share of references in Super Bowl commercials, green car spots were a bit light this year. The game started with the long “2017 Ford Go Further” ad showing people getting stopped from what they want to do. It was full of mobility services Ford is getting into including bike delivery and Chariot van shuttles, but it only gave a brief nod to one of its electric vehicles being charged. Toyota’s Mirai fuel cell vehicle saves the life of a poor daisy being choked to death by fossil fuel pollution. Comic Melissa McCarthy gets to use the 2017 Kia Niro Eco hybrid to drive forward and help save whales, pine trees, ice caps, and rhinos – each time narrowly escaping death in painfully hilarious outcomes. “It’s hard to be an ecowarrior, but it’s easy to drive like one,” says the Kia voice over. Job loss from federal regs: Ford CEO Mark Field’s claim that going forward on the Environmental Protection Agency’s finalized fuel economy and emissions rules will cost the auto industry a million jobs was overstated and inaccurate, according to analysis of the data. During a speech last month at the NADA conference in New Orleans, Fields said that a few studies had shown these results; more recently, a Ford spokeswoman clarified that the analysis came from one report by Center for Automotive Research. The huge job loss was one of several scenarios that the report delved into, with another possible scenario finding that about 144,000 jobs could be created in the auto industry from the federal rules. For the potential million jobs lost, only 322,000 jobs would be in the automotive sector, according to the study. The remaining 805,000 jobs lost would indirectly relation to vehicle manufacturing. Fleet lawsuit against VW: Volkswagen Group is being sued by a company that had acquired a large number of VW diesel vehicles drawn into the emissions “cheating” scandal. German fish distributor Deutsche See sued the automaker for misrepresenting a fleet of vehicles it leased as environmentally friendly. Duetsche See leases about 500 vehicles from VW, and said it had been able to reach an out-of-court settlement. This is the first corporate customer to sue in Germany. The automaker faces several lawsuits from VW owners, regulators, states, and dealers, with many of them coming from U.S. class-action suits. Ioniq coming to America: For those wondering when the first electrified Ionics will be released by Hyundai, a company executive said that will happen this week. Mike O’Brien, vice president-product planning for Hyundai Motor America said that the hybrid and all-electric variations are coming to the U.S. sometime this week. The plug-in hybrid version will roll out in September. The automaker sees the Ioniq sedan, especially the hybrid, playing a big part of its green vehicle strategy. The Ioniq hybrid’s 58 mpg rating should make it competitive with the Toyota Prius. BYD electric buses: Major Australian airport ground transportation provider Carbridge has placed orders for 40 more all-electric buses from BYD. The contract was signed three months after the first BYD Electric Blu bus made its commercial debut at Sydney Airport. The Electric Blu can carry up to 70 passengers and has a range of 400 kilometers (248.5 miles) per charge. “We are the first Chinese company to crack Australia’s electric bus market, having come a long way since the trial of our electric buses at the country’s busiest airport in Sydney in late 2014,” said Liu Xueliang, General Manager of BYD’s Asia Pacific Auto Sales Division. Tesla owners get Ontario incentive: Owners of fully loaded, expensive Tesla Model S and Model X vehicles can now tap into a revised electric vehicle rebate in the Canadian province of Ontario. Consumers are now eligible for the rebate that can go up to $14,000. A cap has been taken off for vehicles that can go over $150,000 in price, such as a Model S P100D. Musk not quitting Trump panel: South African-born U.S. citizen, and Tesla CEO, Elon Musk said he won’t be following Uber CEO Travis Kalanick in quitting President Trump’s economic advisory panel over the immigration issue. Musk claims that he managed to get the immigration ban discussed “first and foremost” on the meeting agenda where it wasn’t even going to be mentioned at all; and that he raised the climate change issue once more. Musk and General Motors CEO Mary Barra were scheduled to meet with Trump at forum on Friday, according to Automotive News. The two main topics were said to be immigration and corporate taxes. LCFS summit: The agenda is available on the Clean, Low-Carbon Fuels Summit hosted by Calstart to be held Feb. 27-28, 2017, in Sacramento, Calif. One panel will include a briefing on the California Public Utilities Commission “SB 350” proceeding, which has recently received proposals by the state’s three largest utilities to collectively invest more than $1 billion in charging infrastructure, with a focus on medium and heavy duty vehicles. A roundtable for truck and bus fleet operators will focus on Renewable Natural Gas (RNG) distributors and farms and other businesses that are sources of biogas. Speakers will include Henry Stern, State Senator, California State Senate; Mike Britt, Director of Maintenance & Engineering, UPS; Richard Corey, Executive Officer, California Air Resources Board; Karen Hamberg, Vice President of Natural Gas Industry and Government Relations, Westport; and Janea Scott, Commissioner, California Energy Commission. In 2013, incentives in China for purchasing plug-in electrified vehicles (PEVs), along with electric buses, jumped up while hybrid electric vehicle subsidies were cut. The definition of new energy vehicle changed exclusively to PEVs as previous new energy incentives for plug-less hybrids were cut. That may change course as the government is considering mandating policy requiring 25% of new vehicle sales to be plug-less hybrids by 2030, according to comments made last week by Ouyang Minggao, who leads a group that China’s auto industry regulator commissioned to set targets for energy-saving vehicles. The report recommends increasing hybrid sales to 8% of total passenger vehicle sales by 2020, and then up to 20% by 2025 and one quarter of sales by 2030. China is also considering extending a tax cut beyond the end of this year for small-engine cars with up to 1.6 liter engines, an industry ministry official said last week. That move could help sustain a sales rebound in small, fuel-efficient vehicles in the world’s largest auto market. China requires automakers to lower the average fuel consumption of their vehicles to 5 liters per 100 kilometers by 2020 from the current 6.9 liters. New energy vehicles will play a part, but now China may be looking to hybrids and small cars to help hit the fuel consumption and emissions targets. This year has seen a steep increase in large SUV sales in China as gasoline prices stay down and consumers with more spending power find SUVs appealing, similar to what’s been seen in the U.S. market. That puts more pressure on China to meet emissions and fuel economy goals. Subsidies to manufacture and purchase PEVs have made a huge difference in the market. Through September, China came close to selling as many cumulative PEVs as the U.S. has seen since they first appeared in the market in late 2010; with the U.S. total at 522,519 cumulative PEVs sold and China finishing the month at 521,649 sold. At the end of 2012, China had only seen 27,800 PEVs sold, with dramatic sales surges seen in 2014 and 2015. If electrified buses were to be included in the total, China would be clearly the world’s leader with 733,447 new energy vehicles sold through the end of 2015, according to HybridCars. Generous government incentives are considered to be a big part of rapid growth in China’s PEV sales. 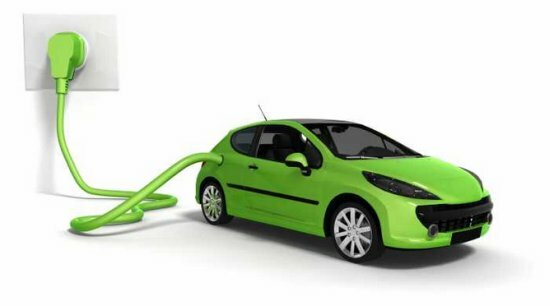 Earlier this year, the Chinese government announced plans to cut 2017-2018 new energy/plug-in vehicle subsidies by 20% from those granted in 2016, and 2019-2020 subsidies will be 40% less than this year. These subsidies will stop after 2020, the government said. Instead, China will support development of a points-based credit system similar to that used in California to encourage production and use of new-energy vehicles. Cutting PEV subsidies may be exacerbated by a scandal reported in September on rule violations by several vehicle manufacturers. Five Chinese bus makers were penalized by the government for taking about 1 billion yuan ($150 million) in illegal subsidies for new energy vehicles. Soon after, an additional 20 automakers were called out for violating these rules. These included global automakers Nissan and Hyundai, and Chinese makers Geely, JAC Motor, and a subsidiary of electric carmaker BYD. The China Association of Automobile Manufacturers changed its forecast for PEV orders to 400,000 from 700,000 vehicles, down 43 percent, last month. China’s top auto industry association slashed its forecast of new energy vehicles that will be ordered this year as the government subsidy scandal widened. Manufacturers such as Zhejiang Geely Holding Group Co. and Hunan Corun have been lobbying the Chinese government to increase support for development of plug-less hybrids. Hunan Corun supplies batteries for Toyota’s China-built hybrids. 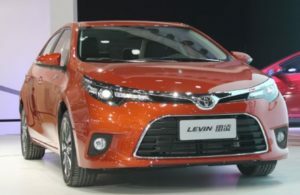 Toyota has made the argument in China that hybrid technology could be more widely accepted by consumers as a solution. Toyota plans to bring a hybrid version of its RAV4 sport utility vehicle to market in China as soon as possible, Matsumoto Shinichi, executive vice president of Toyota’s local engineering and manufacturing unit, said prior to the Beijing auto show earlier this year. The Japanese automaker plans to localize the development and production of hybrid SUVs in China, after introducing its Corolla and Levin hybrid compact cars late last year for a 2018 introduction, including plug-in hybrid variations. 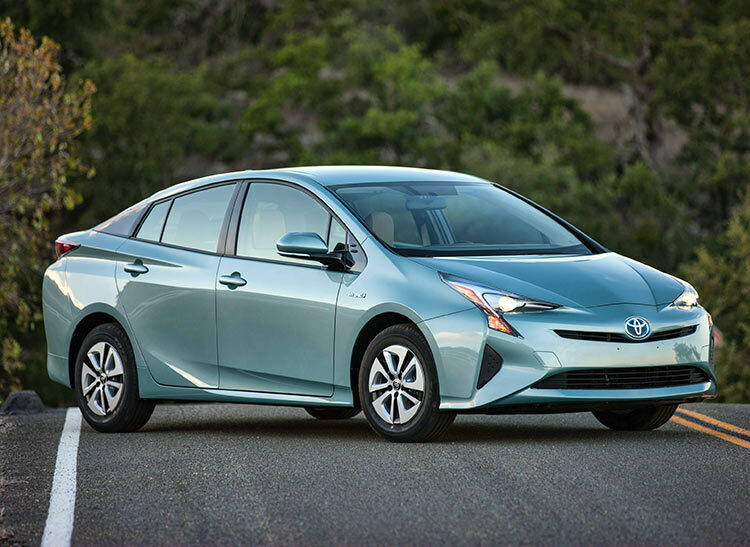 The Toyota Prius has been a flagship for Toyota Motor Co. for about 15 years – and the automaker is counting on the redesigned 2016 model to restore its image as the leading green car on the market. Spy shots show that its body style is changing and will be more in-line with the revamped 2016 Chevrolet Volt; and the mileage will be getting better – sources say the standard Prius hatchback (sometimes called the “Liftback”) will go from a 50 mpg rating to 54 mpg on the window sticker. Toyota faces steep challenges in getting Prius sales back toward upward trending with gasoline prices being where they are; and stiff competition coming from small, fuel-efficient cars and competing alternative technologies. If you study the chart above with the entire Prius model lineup, you’ll see sales dropping for all the variations – with the big one being the Prius Plug-in Hybrid dropping about 70% from a year ago and the mothership model down about 15%. 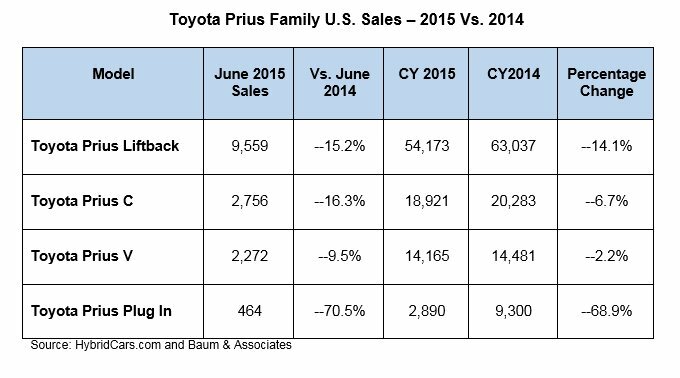 Nationwide, Prius sales fell 12% last year to 207,372 units sold. The Prius had been the No. 1 new vehicle model sold in California during 2012 and 2013, but that model was beaten last year by the Honda Accord. Toyota seems to have lost its commitment to assembling and delivering its Prius Plug-in Hybrid to its dealer network. Pricing is higher than the Prius and Prius C, even with the $2,500 federal tax credit and state incentives on the plug-in version, which makes it more challenging to sell; but a few years ago, the Prius Plug-in Hybrid was doing very well in new vehicle sales, sometimes selling more than the Chevrolet Volt. Less than 500 units (464) were sold in June; for comparison, in March 2015, 473 units were sold and in June 2014, 1,571 units were sold in the U.S. Toyota decided to cease production of the Plug-In Hybrid in June; the company said it was working hard at developing the next generation of the Prius Plug-in Hybrid and will be sharing details on the launch date. The recent decision to extend the launch of the Prius Liftback, C, and V, could push off the next generation Plug-in Hybrid as far as the second half of 2016 as a 2017 model. It’s very typical to see fleet applications of the standard Prius model these days in taxis and in company cars. Toyota hasn’t released data on its fleet sales, but it does offer fleet incentives – for 2016 models, there will be a $500 incentive for the hybrid lineup (Prius, Prius C, and Prius V) versus a $1,000 incentive for the popular Toyota Camry sedan. The Prius Liftback comes in five levels with Two through Five being priced at a bit over $25,000 to just over $30,100. The level One is priced $1,000 less than the Two trim level and is reserved for fleet customers. For Toyota Motor Sales, Toyota’s US division, seeing a lot of Prius taxis being used in markets like New York and Los Angeles isn’t very appealing. “I hate to see Toyotas in taxi fleets but (it) does create an image for us,” said CEO Jim Lentz in 2013. Taxi operators and drivers like the fuel efficiency and ample passenger room in the backseat and trunk area. The Prius is a very good car to drive on crowded city streets, being small and nimble with enough torque to cut through traffic openings. 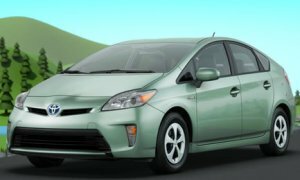 A Toyota dealer in Texas thinks the Prius makes a lot of sense for Uber drivers to save money on their passenger trips. Toyota of Plano is offering hefty discounts and targeted online advertising to Uber drivers – and now is selling about 200 cars per year to these drivers, or 6% if its 3,200 cars sold per year. The future of hybrids has been called into question with moderate gas prices and fuel efficient cars and crossovers becoming more popular. Nissan has killed the hybrid version of its Pathfinder crossover as consumers look increasingly to other Nissan products. Hybrid sales numbers have been declining as a share of nationwide new vehicle sales, especially after gasoline prices started dropping in the summer of 2014. Toyota continues to try out a broad spectrum of technologies and vehicle categories to secure its spot as the No. 1 automaker in global sales – and as an innovator embracing new technologies. Lately, the Toyota Mirai fuel cell vehicle has become Toyota’s favorite alternative technology vehicle to show off. Fleets looking for hybrid and plug-in Class 3-8 trucks and vans have fewer options today than before – with Boulder Electric Vehicles and Smith Electric Vehicles pulling down their shutters and Eaton deciding to leave the hybrid medium-duty truck market in North America. The Parker Hannifin RunWise hydraulic hybrid has been seeing more interest from fleets this year, primarily among refuse trucks, and that’s been expanding into other sectors including parcel delivery trucks. Fleets are impressed with the benefits – including fuel savings up to 4,300 gallons per year for each vehicle; capturing 71% of lost brake energy; and significantly reducing carbon emissions. The Runwise Advanced Series Hybrid Drive System is distinct in the market; when starting up, the engine charges a high-pressure accumulator in the hydraulic system. Hitting the brake pedal drives energy back from a reservoir into the accumulator – driving energy normally lost in braking back into powering the truck. It’s similar to regenerative braking systems currently being used in several hybrid passenger cars. Like other clean transportation options, RunWise brings a significantly higher acquistion cost than comparable internal combustion engine vehicles. 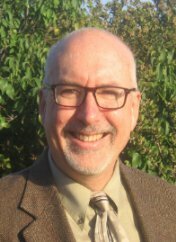 RunWise brings fuel-cost savings – 40%-to-50% less than gasoline and diesel; brakes lasting about four-times longer than traditional braking system replacement cycles; and productivity gains from drivers who like using the hydraulic hybrid trucks, says Tom DeCoster, North American business development manager at Parker Hannifin. Fleet owners are more educated today about their options than years ago, DeCoster said. They’ve been reading up on alternative fuel vehicles and have checked vehicles out at industry conferences. They’re looking to save on fuel and lifecycle costs and have concerns about the driveability and adoption by drivers, DeCoster said. While they’re feeling pressure on reducing emissions, cutting costs has been higher on the list for more fleets. Saving on fuel costs and brakes has been impressing fleets enough to make the investment in RunWise trucks. Payback is about two-to-three years in duty cycles for fleets making the RunWise truck acquisitions, he said. Class 8 refuse trucks with their heavy payload and stop-start patterns are producing a lot of energy captured in the RunWise drive system. Trucks are classifed as “severe duty” in the refuse truck industry as refuse trucks stop and start about 2,000 times a day while collecting garbage. Fleets are starting to take battery-powered vehicles more seriously this year than before and are looking at their options. Along with RunWise, Smith Electric Vehicles is resuming production this fall of its Newton trucks; TransPower offers Class 8 drayage tractors that are being field tested at the Port of Los Angeles; Electric Vehicles International has delivered electric walk-in vans to UPS and Frito-Lay; Zero Truck converts Isuzu NPR medium-duty trucks to electric vehicles for municipalities; Hino Trucks, which just celebrated 30 years doing business in the US, since 2012 has offered its Class 5 cab-over diesel-electric hybrids; and XL Hybrids just received certification from the California Air Resources Board (CARB) for its hybrid-electric conversions of Chevrolet Express and GMC Savana vans. 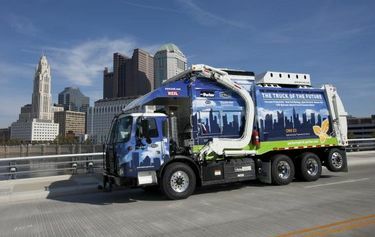 Waste Management Inc. has been entirely committed to natural gas vehicles, but other major refuse service companies are bringing in hydraulic hybrids to meet cost saving and emissions reducing targets, DeCoster said. Most of Parker Hannifin’s business has been in trash trucks, but delivery fleets are starting to bring in hydraulic hybrids, he said. Transit and shuttle bus facilities are acquiring buses with RunWise hydraulic hybrid systems. Parker Hannifin is also working with a major alternative fuel OEM to manufacture hydraulic hybrid trucks using natural gas as their fuel, DeCoster said. Ever since the economic collapse of the auto industry that started in 2008, dealers have been undergoing changes in how they do business. Dealers understand that they’ve got to become stronger in customer service to build loyalty and can’t just stick to old upselling methods. They’re accepting that women make the majority of family car purchase decisions; that young people are holding off purchases longer than Baby Boomers did after first getting their drivers licenses; and that there’s a lot more car shopper interest in green cars such as hybrids and electric vehicles (EVs). There has been a lot of concern expressed that dealer staff haven’t been supportive and informed enough about EVs – mainly because it’s a longer selling process and isn’t as profitable as typical gasoline-engine cars. Those sales reps are very tied into closing sales quickly in how they make their living – and they could use more training and education in answering consumer questions. As I wrote about not long ago in Green Auto Market (and its then-sibling blog Green Machine Digest), I was one of those green-interested car buyers. Well, a few days ago, I had a painful reminder about what I don’t like about the dealer experience and what does work for me. Last year, I said yes to an aftermarket car alarm system for my 2013 Toyota Prius. Was I duped into it? Not necessarily – the Prius is an attractive car in California and there’s probably thieves looking for them as profit center, or so I thought. Actually, they’re not appealing to car thieves, according to a study by the National Insurance Crime Bureau – the Prius theft rate is much lower than the typical car. There’s a couple of reasons for that – one is that the Prius has several unique parts that can only be used in other Priuses, which cuts down the stripped parts market potential (and which makes for a big part of the car theft market). Another reason is that the Prius doesn’t have a key – it uses a remote fob to open its doors. That also cuts down the appeal to car thieves who usually don’t get their hands on the Prius key fob. I discovered the problem with my alarm system while attempting to start the parked Prius on Friday afternoon. As I pushed the start button, the left and right turn indicators simultaneously flashed and the engine wouldn’t start. I attempted to open the door, and the alarm went off – loud enough to get stared at by several people wondering why I had jumped out of the car desperately attempting to stop the alarm by pressing buttons on the key fob. Somehow it did stop, and I tried it again only to find the same thing – flashing lights on the panel and loud honking when I opened the door. I called the dealer where I’d bought the car and had gone to for routine service a few times. The alarm system guy was gone and wouldn’t be back until sometime Saturday. I explained that I couldn’t start my car and drive home; all I received from the service department staffer was a phone number for the vendor who provides them with the alarm system. Nobody answered the phone at that office. So, I called Toyota corporate roadside assistance. They sent out a tow truck who got me to another Toyota dealer close to where I’d gotten stalled out. My choices were explained to me by the service department – have their service technician dismantle the alarm control box or go to my original dealer and have them deal with it. I told them to unplug the alarm system and I would have it fixed later or just live without it. Strangely enough, after the alarm control box was removed the beeping sound quieted down a bit when locking and unlocking the doors – another annoyance I can live without. The customer service experience was positive at this Toyota dealer – including offering me a free shuttle trip home so that I wouldn’t have to wait around at the dealership for the repair to be completed. The service department assistant manager was very knowledgeable about the security system and about the Prius overall – which is one of the benefits of working with automakers and their dealer networks who have years of experience to go by. The original dealer sales rep was very good with me about sitting in the car and answering my questions last year while I was shopping for the car – and giving me all the time needed to make the acquisition decision. The problem started with going to the Finance & Insurance rep and having to sift through the sales tactics. I do regret the alarm system purchase decision, but not the other ones. I do love my Prius and will look at the plug-in hybrid version later on. I do want to own an all-electric or plug-in hybrid EV, but the ownership costs and charging station accessibility need to improve. I would hope that the dealer experience goes in a similar direction. Follow the money: A recent survey by AutoTrader.com says that the top reasons shoppers would consider purchasing an AFV are less emotional and more practical, with three of the top five being related to saving money. “Better fuel economy” came in first at 70%, followed by “Cost of savings on gas” at 56%, “Cleaner emissions” at 37%, “Better for the environment” at 28% and “Federal Tax Credit” at 24%. The survey measured consumer attitudes on a range of fuels and technologies including diesels, hybrids, electric vehicles and plug-in hybrids. The study also found that perceptions about battery life/range are working against hybrid and plug-in vehicles. Diesel is facing concerns about the fuel expense, the cost of the vehicles, and potentially high cost of maintenance. Luxury buyers: Phoenix International’s recent finding on AFVs found that luxury SUV consumers and non-luxury car consumers have the most interest; hybrid and electric vehicles are in the non-luxury car category, so that wasn’t a surprise in the survey findings. What about luxury SUVs? Diesel SUVs have been growing in popularity, which seems to have opened the door for car shoppers to consider alternatives, along with the perception that AFVs partially embody the latest in automotive technology. Phoenix International finds it very interesting that Tesla Motors is going after all of the luxury market by adding its upcoming Model X – an electric SUV – to its model lineup next year. As for branding: In the AutoTrader study, for all the automakers who offer AFVs, seven had high awareness among survey respondents: Toyota, Honda, Ford, Lexus, Chevrolet, Nissan, and Volkswagen. When asked which automakers they would identify as leading in the space, Toyota came out on top with 48%, Honda came in second with 28%, and Ford made third place with 25%. As for sub-brands: Green Car Reports made a very convincing point that the way automakers are marketing green sub-brands aren’t clicking very well for name retention. The article gives readers a test – to read a list of sub-brands for automaker green technology offerings, then scan a list of automaker brand names, and then accurately connect the dots. Here’s the correct answers: BlueEfficiency – Mercedes-Benz; BlueMotion – Volkswagen; Drive-E – Volvo; EarthDreams – Honda; EcoBoost – Ford; EcoTec – GM; EfficientDynamics – BMW; Hybrid Synergy Drive – Toyota; PureDrive – Nissan; and SkyActiv – Mazda. Ford’s EcoBoost has stuck with many minds along with Mazda’s SkyActiv; Honda’s EarthDreams and Toyota’s Hybrid Synergy Drive stand out a little bit. The other ones seem pretty forgetful (at least for this writer). Most everyone reading business news these days and going to conferences are hearing a lot of information on young people, who are typically referred to as Millennials or GenY. The number of young people in this demographic is huge – kids of Baby Boomers are much larger in numbers than the previous generation, which has been called GenX. It’s good to get educated and updated on some of the study findings, as these people are being educated and employed, working up the ranks, and are making very significant transportation decisions. So here are a few trends and perspectives to think about…..
Age range: They’ve been born somewhere between 1980 to the mid-1990s – so they’re about 18 to 33 years old. No longer in love with cars: While their parents got their drivers licenses soon after turning 16, that’s getting extended much longer these days – some of them up to age 20. Their interesting in buying a car or inheriting an aged family car is much less than it was 25 years ago. There’s a lot of concern among automakers and dealers that this huge market segment is buying fewer cars than Baby Boomers and Generation X – and that there’s quite a lot of them. They are very interested in green transportation – hybrids and electric vehicles; car sharing and public transportation makes sense to them. They are more likely to embrace autonomous, driverless vehicles than their parents seem to be. They’re very utilitarian about transportation and don’t look forward to driving spacious cars and crossovers, luxury vehicles, or pickups like many other consumers in the US market. We’re starting to see a lot of recognition of these deeper trends from BMW testing out EV and urban transportation options, and Ford being active on intelligent highway consortiums. Automakers are starting to change their identities from vehicle manufacturers to transportation providers, and seem to recognize that it’s critical to go this route to engage brand loyalty from Millennials. Extremely pragmatic and independent – with “Whatever!” being their teenager mantra: You may notice young people don’t carry some of the social order unspoken rules that their parents did. If they’re dating someone from another racial/ethnic group or have friends who are gay, lesbian, or bisexual, it’s not an issue for them. They don’t seem to understand their parents being uneasy about it. Dad might say, “Well, one of my friends in college was gay,” to offer support, and his son will tell him that he’s being discriminatory. Don’t have the same work ethic and habits of someone over 40: Mom and dad might be willing to work really long hours and get pay raises, but their kids usually march to the beat of a different drummer. They tend to be focused more on basic living expenses and pragmatic necessities. Many times, they were given a lot of stuff already by their parents and it doesn’t impress them all that much anymore. They might get absorbed in a new project at the office for a few weeks, but won’t necessarily consistently deliver on what was asked of them by their employers. That can be a source of frustration for young employees and older supervisors who see a generational split. Very special education: They received lots of awards at school from an early age for just about anything, including showing up in the classroom. Their parents demanded excellent education for them and moved them to the best high schools to get the highest test scores, earn college credits, and take music lessons. The sad part is that many of these kids have bachelor’s and master’s degrees and are struggling to get jobs. Distraction is a problem: They grew up gaming and surfing the web – and do spend a lot of time staring into their phones. They’re capable of doing four things at once, but focusing on one task for very long can be tough for them – not to mention for their supervisors. There’s a lot of emphasis lately on distracted driving by young people being a crisis, according to safety specialists. However, that might be a bit extreme since there are less of them driving than in the past and cars are safer these days. The problem with people texting and talking on their smartphone while driving extends to all generations; state laws are getting tough to try and deal with it. Get creative about connecting with them. As Scott Pechstein, VP of Sales for Autobytel recently told Automotive Digest, it’s taking a lot of work for dealers to reach young consumers. Facebook, social media, and reputation of the dealership is important to them. 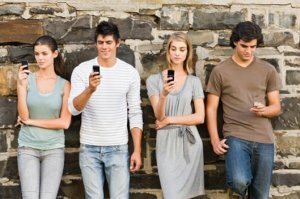 Social media and speaking to them via text in the style and method Millennials want to be spoken to are necessary to reach the market segment. Younger car shoppers (especially first-time buyers) are very interested in seven-inch touchscreens on the new compact Chevrolet Spark. Pairing is available to the iPhone or Android and other mobile devices for contact lists, stored music, reading and composing text messages, videos and slideshows, and other perks on Chevy’s MyLink infotainment system. There are persuasive articles out there saying Millennials are more similar to previous generations than you’d think. While their style, communications, interests, and love affair with cars seems to be different than their elders, they are coming through with typical behaviors seen for many years in the workplace and retail environment. Much of that comes through their background – education, family, peer group, opinions, life experiences, etc. Looking for a profitable used vehicle market segment to reach? How about green cars – hybrids, electric vehicles, and fuel efficient vehicles? Franchised and independent dealers are seeing a lot of used inventory on the market today, and some of it, especially trucks, is seeing strong pricing. What we’re seeing though, such as in Manheim’s latest report, is that dealers are doing well by selling lots of used vehicle the right way. Prices might be down on small, fuel efficient cars and hybrids, but all things considered, they’re not bad – and selling a lot of them can be profitable. There are two interesting announcements from last week that speak to the issue – one is that Nissan has added its Leaf electric car to its certified pre-owned vehicle list; and the other is an online tool for used cars rating fuel efficiency and emissions from the US Dept. of Energy (DOE) and Environmental Protection Agency (EPA). Certified Leafs will get an extended warranty of seven years or 100,000 miles on both the electric system and powertrain. To be considered, the used Leaf must be less than five years old, have fewer than 60,000 miles, and have at least nine of 12 bars of battery capacity remaining on the gauge. It also needs to have a clean Carfax history report, and pass an inspection where 167 separate items are checked. Two warranties on the battery pack will remain in place – eight years or 100,000 miles, and five years or 60,000 miles, with a few performance indicators being checked on each warranty. The new certified program adds to the protections. 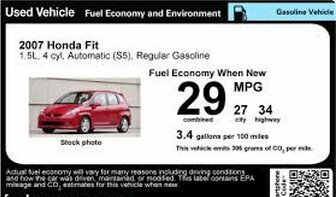 For the DOE and EPA offering, dealers and consumers can now place a used car label based on fuel economy and emissions performance. It’s a free online tool allowing for creation of a consumer-friendly label that lists gas mileage and CO2 emissions levels of used vehicles sold in the US since 1984. Other indicators that used green cars is a viable market segment to reach include eBay’s Green Driving (which they say gets a lot of traffic); NADA Used Car Guide’s Plug-in Electric Vehicles: Market Analysis and Used Price Forecast; and ALG’s Alternative Powertrain Perceived Quality Study. Here’s how US green vehicle sales fared during the month of July…. Toyota had a very strong sales month overall with a 17% increase over June, bumping out Ford’s place on the ranking list for the first time since March 2010. 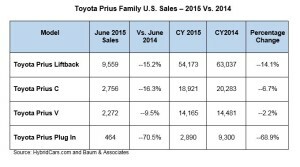 The Prius family played a big role in the outcome with a 40% increase and sales of 23,294 units for its best sales month ever. Plug-in electric vehicle sales were fairly strong during the month and are moving closer to the 100,000 units sales mark for the year – they’re averaging more than 7,000 a month but were down to about 5,900 in July. The Nissan Leaf beat the Chevy Volt in sales volume – 1,864 units sold for the Leaf versus 1,788 for the Volt. They’re running neck-to-neck so far this year with the Leaf slightly out in front – 11,703 for the Leaf and 11,643 for the Volt. The Leaf has shot way up in sales this year – more units sold in the US in 2013 than during all of 2011 or 2012. The Volt has been keeping pace with last year but moved ahead – it’s now nearly 1,000 Volts ahead of last year’s 10,666 units sold in the first seven months. The Toyota Prius Plug-In Hybrid is still ahead of Ford – 817 units sold in July versus 433 of the Ford C-Max Energi and 407 of the Ford Fusion Energi plug-in hybrids. The Chevrolet Spark EV sold 103 units in July in California and Oregon only. It’s doing a little bit better than other “compliance cars” in sales – the Mitsubishi i-MiEV sold 46 units, the Smart Electric Drive hit 58, and the Honda Fit EV had 63 units leased out. The Spark was behind two other electric vehicles – the Ford Focus EV at 150 units and the Toyota RAV4 EV at 109. Yet, the Spark was only in its second month on the market and only in two markets.